AMSTERDAM, Netherlands, April 2, 2019 – Ford today unveiled the stylish and distinctive range of all-new Kuga SUVs, debuting sleek new exterior design with premium proportions that deliver improved roominess and comfort. Ford’s most electrified vehicle ever, the sophisticated all-new Kuga Titanium, sporty Kuga ST‑Line and upscale Kuga Vignale will offer an advanced range of hybrid powertrains for unprecedented Ford SUV fuel-efficiency. 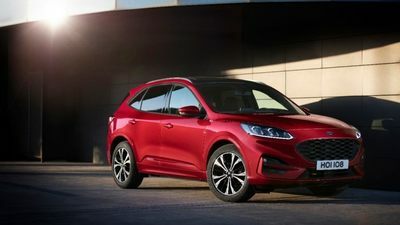 The comprehensive line-up includes Kuga Plug-In Hybrid, Kuga EcoBlue Hybrid (mild-hybrid) and Kuga Hybrid (full-hybrid) variants, alongside Ford’s 2.0-litre EcoBlue diesel, 1.5‑litre EcoBlue diesel and 1.5‑litre EcoBoost petrol engines, and intelligent new eight-speed automatic transmission. Kuga is Ford’s best-selling SUV in Europe and the No. 3 best-selling Ford vehicle in the region after the Fiesta and Focus. Customers purchased 153,800 Kugas in 2018, contributing to a Ford SUV sales increase of more than more than 19 per cent last year. The all-new Kuga offers even more intuitive comfort and driver assistance features, keeping customers better connected on the move. Sophisticated technologies include a FordPass Connect embedded modem, wireless charging pad technologies, and Ford’s SYNC 3 infotainment system supported by an 8‑inch central touchscreen. A premium B&O Sound System produces a high quality audio experience, and a new industry-first, free-form, 12.3-inch LCD instrument cluster with “true colour” that is more informative, intuitive and easier to read. New Stop & Go, Speed Sign Recognition and Lane-Centring technologies help drivers negotiate stop-start and highway traffic with greater confidence than ever before, while predictive curve light and sign-based light help drivers see more clearly in the dark. Head-up display technology helps drivers to keep their eyes on the road ahead, and Active Park Assist 2 enables fully automated parking manoeuvres at the push of a button. “The all-new Kuga is our best example yet of Ford’s human-centric design approach; developed in close collaboration with SUV customers to deliver distinctive style, unprecedented powertrain choice, premium comfort and advanced technologies that make life easier for owners inside and outside of the car,” said Stuart Rowley, president, Ford of Europe. The all-new Kuga is the third generation of Ford’s mid-size SUV for customers in Europe since the nameplate’s introduction in 2008. Ford has sold more than 1 million Kugas in Europe since 2008. The all-new Kuga is the first SUV to be based on Ford’s new global C2 architecture that supports improved aerodynamics for better fuel-efficiency, and reduces weight versus outgoing models by up to 90 kg when comparing equivalent powertrain variants. In addition, the new architecture is designed to enhance crash performance; delivers 10 per cent more torsional stiffness for improved driving dynamics and refinement; and creates more interior space for Ford’s mid-size models while still enabling expressive and dynamic design. The all-new Kuga introduces distinctive new exterior design that is more sculpted and simplified with premium proportions. A more streamlined silhouette incorporates a longer wheelbase that creates a larger footprint on the road benefitting ride and stability; a longer bonnet; further reclined rear windshield angle; and lower roofline. The result is a more energetic, nimble and capable appearance than ever before. A tailored spectrum of choice includes differentiating executions for Kuga Vignale, ST-Line and Titanium variants, each with a unique character to reflect customers’ personalities. With contemporary and confident styling, Kuga Titanium is indicative of the high specification and quality that will be offered to customers across Europe. Highlights include a sporty front skid plate and rear diffuser, body-coloured mirrors, side cladding and door handles, LED daytime running lights and standard 17-inch, or optional 19-inch alloy wheels. The upscale Kuga Vignale conveys exclusive specification and meticulous craftsmanship through bespoke Vignale ornamentation including satin aluminium finishes for the roof rails, bumpers and rocker inserts, as well as unique, elegant front and rear bumper designs. The exterior also features signature Vignale chrome finished front mesh grille and twin tailpipes, alongside standard 18-inch, and optional 19-inch or 20-inch alloy wheels. Windsor leather seats with an exclusive Vignale hexagon design, a leather wrapped heated steering wheel and premium velour floor mats further enhance the interior. Bold Kuga ST-Line styling inspired by Ford Performance models includes body-coloured bumpers and side skirts; and a grille, front skid plate, rear diffusor and roof rails finished in black. A large rear spoiler, standard 18‑inch or optional 19-inch alloy wheels, and twin sports exhausts add to the sporty character. Inside a dark headliner, exclusive ST-Line seat designs with contrasting red stitching, alloy pedals, flat-bottomed steering wheel, and ST-Line floor mats and scuff plates reflect the performance personality. All-new Kuga is offered in 12 colours, including new metallic Diffused Silver and Sedona Orange. Blue Panther, a new finish offered exclusively on Vignale models, joins premium paint finishes triple coat Lucid Red and Star White pearl. Following Ford’s announcement earlier this year that every Ford nameplate from all-new Focus onwards will include an electrified option, the all-new Kuga will become the first Ford vehicle to be offered with plug-in hybrid, mild-hybrid and full-hybrid powertrain technology. Kuga Plug-In Hybrid: Available from launch, the all-new Kuga Plug-In Hybrid delivers the driving range and freedom offered by a traditional combustion engine alongside the efficiency and refinement of an electric powertrain. The battery can be charged using a front fender-mounted charging port, and is automatically replenished on the move using regenerative charging technology that captures kinetic energy normally lost during braking. It is anticipated that to fully charge the battery from an external 230-volt electricity supply will take around 4 hours. Drivers can choose when and how to deploy battery power using EV Auto, EV Now, EV Later and EV Charge modes. When the battery reaches its lowest state-of-charge, the Kuga automatically reverts to EV Auto mode – supplementing petrol engine power with electric motor assistance using recaptured energy for optimised fuel-efficiency. Kuga EcoBlue Hybrid: The all-new Kuga EcoBlue Hybrid enhances Ford’s 150 PS 2.0‑litre EcoBlue diesel engine for even greater fuel-efficiency. The mild-hybrid technology employs a belt-driven integrated starter/generator (BISG) that replaces the standard alternator, enabling recovery and storage of energy during vehicle decelerations, and charging a 48-volt lithium-ion air-cooled battery pack. The BISG also acts as a motor, using the stored energy to provide electric torque assistance to the engine under normal driving and acceleration, as well as running the vehicle’s electrical ancillaries. The 48-volt system also enables the all-new Kuga’s Auto Start-Stop technology to operate in more situations for additional fuel savings, contributing to anticipated CO2 emissions from 132 g/km CO2 and 5.0 l/100 km fuel-efficiency. Kuga Hybrid: The Kuga Hybrid uses a self-charging full-hybrid powertrain that enables pure-electric driving capability and combines a 2.5-litre Atkinson cycle petrol engine; electric motor; generator; lithium-ion battery; and a Ford-developed power-split automatic transmission. The Kuga Hybrid will be available later in 2020 with front-wheel drive and Ford Intelligent All-Wheel Drive, delivering from an anticipated 130 g/km CO2 and 5.6 l/100 km. All-new Kuga customers can also choose from an advanced range of Ford EcoBoost petrol and Ford EcoBlue diesel engines with optimised power and refinement, and meeting the latest stringent Euro 6 emissions standards calculated using the World Harmonised Light Vehicle Test Procedure (WLTP). Powertrains are supported by standard Auto Start-Stop for reduced running costs, and transmissions including a slick-shifting six-speed manual and new eight-speed automatic for effortless cruising. Kuga EcoBoost: The 1.5-litre EcoBoost engine is offered with 120 PS and 150 PS and is anticipated to deliver from 6.5 l/100 km fuel-efficiency and 149 g/km CO2 emissions supported by Ford’s industry-first cylinder deactivation system for a three-cylinder engine. The technology can automatically stop one of the engine’s cylinders when full capacity is not needed, such as when coasting or cruising with light demand on the engine. Cylinder deactivation can disengage or re-engage one cylinder in 14 milliseconds – 20 times faster than the blink of an eye – with no compromise in performance or refinement. The all-new Kuga’s 190 PS 2.0-litre EcoBlue engine is combined with Ford Intelligent All-Wheel Drive, and optimises low-end torque and noise, vibration and harshness, while also providing smooth and linear acceleration performance for a more comfortable driving experience. Kuga also offers for the first time selectable Drive Mode technology that enables drivers to adjust throttle response, steering weight and traction control, plus gearshift timings for automatic models, to match responses and performance to the driving scenarios. Alongside Normal, Sport and Eco modes, Slippery mode offers drivers increased confidence on surfaces with reduced grip such as snow and ice. Deep Snow/Sand mode helps maintain vehicle momentum on soft, deformable surfaces. The all-new Kuga makes it easier than ever to tow anything from to small trailers to large caravans using two innovative towing solutions, and towing capacity up to 2,250 kg depending on powertrain configuration. An electrically operated retractable tow bar can be controlled using a conveniently located button in the boot space. Push the button once and the ball neck travels out from its stowage position under the vehicle. With another push of the button it automatically disappears back underneath the car. In addition, a detachable tow bar also is available and can be easily locked into place. When not in use the ball neck is stored in the boot. Comfort, spaciousness and flexibility are key to the more refined Kuga occupant experience that delivers class leading second row roominess. The all-new Kuga is 44 mm wider and 89 mm longer than the outgoing model, while the wheelbase has increased by 20 mm. Inside, that translates to 43 mm more shoulder room and 57 mm more hip room in the front seats than the outgoing model, while rear passengers benefit from 20 mm more shoulder room and 36 mm more hip room. Despite an overall height that is 20 mm lower than the outgoing model, all-new Kuga also has 13 mm more headroom for front seat occupants and 35 mm more in the rear. For rear seat passengers, heated outer seats are available for the first time, and the entire second row of seats can be moved backwards for best-in-class 1,035 mm rear legroom, or forwards to increase boot space by 67 litres. A remote release function enables the second row to be folded flat with ease. The boot also has a reversible luggage compartment mat with a high quality velour on one side for a premium look and feel, and a durable and robust rubber surface on the other side to prevent wet or muddy sports equipment from soiling the interior. Spacious, practical and well connected – all-new Kuga interior introduces innovative engineering and advanced comfort and convenience technologies that help the vehicle seamlessly integrate into customers’ lives. Also helping drivers stay connected on the move and wave goodbye to a tangle of cables in the centre console, a new wireless charging pad beneath the instrument panel enables occupants to easily charge compatible smartphones. The pad automatically detects compatible devices to initiate charging. Devices can remain connected via Bluetooth to Ford’s SYNC 3 communications and entertainment system while using wireless charging, which is supported by an 8-inch central touchscreen that can be operated using pinch and swipe gestures. SYNC 3 allows drivers to control audio, navigation and climate functions plus connected smartphones using simple voice commands. Apple CarPlay and Android Auto™ compatibility is included free-of-charge. A new 12.3-inch LCD instrument cluster is the first in the industry to use free-form technology that allows curved upper edges for seamless interior design. The free-form panel features circuitry embedded across the display, enabling designers to mould it into shapes beyond the traditional rectangular design. In addition, the 24‑bit “true colour” digital instrument cluster generates detailed, high definition, more intuitive images and icons displayed in the full colour spectrum, making them brighter, less tiring on the eyes and easier to read. A new B&O Sound System will help occupants get the best from music streamed via FordPass Connect or smartphone devices. The powerful 575-watt, 10-speaker system features an external coupled subwoofer that guarantees smooth bass production, while the position of the tweeters in the dashboard has been optimised to produce a wider sound stage at seating level to for an enveloping listening experience for all occupants. Comprehensive static and dynamic sound tuning ensures that the listening experience is maintained regardless of the driving conditions. Ford’s hands-free tailgate technology allows access to the boot space even with arms full of groceries, kids or sports equipment, using a simple kicking motion under the rear bumper. Ford engineers have also delivered a solution to the challenge of where to place the cargo shade once removed: it now fits neatly beneath the new flexible load floor, and is easier to remove with a simple pull-strap release. Enhancing interior refinement, Active Noise Control employs three microphones, strategically placed throughout the cabin, to monitor engine noise in the interior. The system then directs opposing sound waves through the audio system to cancel out unwanted engine and transmission noises. Standard for Kuga Plug-In Hybrid Vignale, Kuga EcoBlue Hybrid and Kuga 2.0-litre EcoBlue Vignale models, the technology contributes to a new level of interior quietness. The all-new Kuga further enhances the SUV driving experience with an advanced suite of driver assistance technologies designed to give drivers confidence behind the wheel and help them to stay focused while on the move. Sophisticated Ford Co-Pilot360 technologies enhance protection, driving and parking, and are designed to make the driving experience more comfortable, less demanding and safer. Making its Ford debut, new Lane-Keeping System with Blind Spot Assist will combine Ford’s Blind Spot Information System (BLIS) and Lane-Keeping System to monitor the driver’s blind spot for vehicles approaching from behind while travelling on multi-lane carriageways. If a driver either signals a lane change or the control system senses a lane change when a vehicle is approaching in the blind spot that could lead to a potential collision, counter-steering is applied to warn the driver and discourage the lane change manoeuvre. Also further enhanced, Ford’s Pre-Collision Assist with Pedestrian and Cyclist Detection technology will feature a new Intersection functionality, which can automatically apply the brakes to avoid or mitigate the effects of accidents if the driver is turning across the path of oncoming traffic and the system determines an imminent collision. Adaptive Cruise Control (ACC) with Stop & Go, Speed Sign Recognition and Lane-Centring helps the vehicle maintain a comfortable driving distance from vehicles ahead. The system also helps reduce stress during long road trips by keeping the vehicle centred in its lane, and can adjust the vehicle speed to within legal limits by monitoring the roadside and overhead gantries for speed signs. This is in addition to using information from the on-board navigation system. Kuga is the first Ford SUV in Europe to offer a head-up display (HUD), which helps drivers keep their eyes on the road by projecting useful information into their field of vision. The system maximises effectiveness with one of the largest fields of view of any HUD available in Europe, measuring 6 degrees by 2.5 degrees. The system is also amongst the brightest available, adjustable in 16 increments up to 10,000 candela per metre2. Special filters for the retractable polycarbonate screen mean that it can be read by users wearing polarised lenses. Depending on vehicle specification, the configurable selection of projected information includes speed – the only content that is always present; Traffic Sign Recognition; ACC; navigation; Shift Indicator; entertainment system; and emergency notifications. BLIS with Cross Traffic Alert warns drivers reversing out of a parking space of vehicles that may soon be crossing behind them and can apply the brakes to avoid or mitigate the effects of collisions if drivers do not respond to warnings. Stop & Go enables the ACC system to bring the vehicle to a complete halt in stop-start traffic using up to 50 per cent of total braking force, and automatically pull away if the stopping duration is less than 3 seconds. For stopping durations greater than 3 seconds, the driver can push a steering wheel button or gently apply the accelerator pull away. Active Park Assist 2 makes parking even easier: delivering fully-automated manoeuvres into and out of parallel and perpendicular parking spaces at the push of a button. Enabled by the shift-by-wire capability of Ford’s new eight-speed automatic gearbox, the system identifies suitable parking spaces and the driver can control vehicle motion by simply selecting neutral and holding down a single centre console-mounted button. The vehicle then fully controls forward and reverse gear selection, throttle and braking, as well as steering – manoeuvring into spaces just 92 centimetres longer than the car and on gradients up to 12 per cent at speeds of up to 4 km/h (2.5 mph), before engaging park. The technology can also help driver exit parallel parking spaces using fully automated Park-out Assist. Ford’s Adaptive Front Lighting System with predictive curve light and sign-based light pre-adjusts headlamp patterns for maximum visibility before reaching a curve, junction or roundabout. The system uses the forward-facing camera to monitor lane markings up to 65 metres ahead, enabling light from the headlamps to be angled into the corner pre-emptively for improved visibility on approach, rather than relying solely on the driver’s steering wheel inputs. The Ford-patented integration of road sign-reading capability to optimise beam patterns enables the beam to be widened at junctions and roundabouts to better illuminate hazards that are not in the direction of travel. Glare-free high beam removes the guilt of accidentally dazzling other drivers and helps users see more of the road ahead at night with headlamps that use an innovative adjustable drum configuration for greater flexibility and softer, less distracting transitions. Should an accident occur, new Post-Collision Braking technology helps to reduce the impact of a potential secondary collision by automatically applying moderate brake pressure when an initial collision event is detected; slowing the vehicle can potentially lessen injury to occupants and further damage to the vehicle. Ford of Europe is responsible for producing, selling and servicing Ford brand vehicles in 50 individual markets and employs approximately 53,000 employees at its wholly owned facilities and approximately 67,000 people when joint ventures and unconsolidated businesses are included. In addition to Ford Motor Credit Company, Ford Europe operations include Ford Customer Service Division and 24 manufacturing facilities (16 wholly owned or consolidated joint venture facilities and eight unconsolidated joint venture facilities). The first Ford cars were shipped to Europe in 1903 – the same year Ford Motor Company was founded. European production started in 1911.